A damp or wet basement is more than a nuisance, it can damage the property, contribute to mold growth, and destroy personal possessions. For homeowners coping with wetness, mold, and damp basements, waterproofing the home by keeping the water out in the first place can help. A home with a basement should also have gutters. Water runoff from rain or melting snow and ice can easily fall from the roof to the ground and is one of the biggest causes of a wet basement. Homeowners who install gutters and keep them free of debris can redirect this water away from the home, resulting in a drier basement. For best results, the gutters should be cleaned regularly and the downspouts should empty at least six feet away from the home. When rain falls or the sprinklers run, the resulting water needs somewhere to go. It will take the easiest possible path, the one that runs downhill. 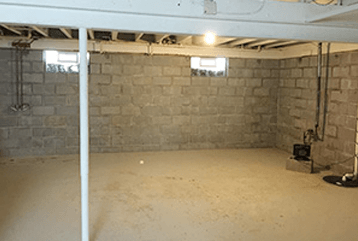 If basement wetness is a concern, then the homeowner should make sure that the ground around the home has the correct grading. Water should be directed away from the home, not towards it. Depending on the home’s location and age, the landscaping or grading may need to be artificially built up to ensure that rainwater runoff goes in the correct direction, away from the basement. Grading one inch per foot and for the first six feet surrounding the home will aid the waterproofing effort and help the basement stay dry. Painting a sealing product on the basement walls will help keep a damp basement dry. While a brush on sealant won’t prevent flooding or large amounts of water from entering the basement it can significantly reduce the amount of residual moisture and wetness that occurs. Floors can be sealed as well, preventing further damage. These various steps of waterproofing should aid in helping keeping your basement dry throughout the year.